Residents of both the ROK and the PRC often invoke their respective nation’s millennia-old history as an integral part of their identity and worldview. One might find, therefore, that a sense of history would have an influence on relations between the two neighbors. While history and historical consciousness can, indeed, be seen to play a role in separating China and South Korea and bringing them together, it is apparent that leaders on both sides have made a consistent and conscious effort to prioritize geopolitical and economic issues over historical ones. Citizens and netizens, in contrast, keep historical issues alive in ways that complicate the agendas of officials and statesmen. On the South Korean side, historical memories have resonated in wariness about ongoing Sino-ROK relations: premodern tributary relations that left Korea in a state of dependency (sadae), the Korean War in which China approved North Korea’s attack and then came to its defense, and the Cold War period of Chinese backing North Korea even as it repeatedly acted belligerently. Above all, China’s cultural haughtiness—its assumption of civilizational superiority and great power status deserving of deference—has left South Koreans on alert. Historical narratives matter in Sino-Korean relations in part because of concern that Sinocentrism is on the rise and the corresponding fear that China would claim hegemony as it did in the premodern regional order. This could shape Chinese claims to a special relationship with North Korea or a hierarchical regional order exclusive of outside powers. With Sino-ROK relations at a turning point in 2016 after China rejected the way the Park administration is responding to North Korea including the decision to deploy the THAAD missile defense system, there is much uncertainty about the reasoning that will guide Beijing in the coming stage of relations with Seoul. As evidence of how history can be invoked in defiance of the international community and some of China’s neighbors, one only need consider how Chinese officials rejected the international court’s ruling on the South China Sea. For South Koreans the unexpected, insensitive responses by Chinese officials in January 2016 to alarm over the fourth North Korean nuclear test brought anxieties rooted in history right to the forefront. Since the early 2000s, two contrasting images of the historical divide between Chinese and South Koreans have drawn widespread attention. First is the sharp divide over which country is the heir to an ancient kingdom, and the ramifications of China’s pretensions to be the successor state for at least a portion of the Korean population. Another is the strong overlap in historical memories of imperial Japan during the first half of the 20th century, which Koreans have come to depict as China’s cudgel for reshaping foreign relations in Northeast Asia. The fact that history became so conspicuous on two occasions only a decade apart in Sino-ROK relations suggests that we need to look beyond specific cases to seek a broader grasp—in this case emphasizing South Korean thinking—of how history still matters. History, or more accurately differing perceptions of history, played a pivotal role in significantly transforming relations between the PRC and the ROK in the early years of the 21st century. After the two nations normalized diplomatic and economic relations in 1992, they enjoyed a decade of intensifying economic, diplomatic, social, and personal ties. For many in South Korea, this was a welcome development as a growing number began to look to China as a natural friend in the region, particularly at a time of increasing anti-American sentiment. But then came news of the Northeast Project. A mammoth scholarly and archeological project spearheaded by the Chinese Academy of Social Sciences (CASS), the Northeast Project emphasized how the peoples in China’s Northeast (Liaoning, Jilin, and Heilongjiang provinces) were and had always been a part of China’s history regardless of whether they were of Han ethnicity. This meant, among other things, that the ancient kingdom of Koguryo (trad. 37 B.C.-668 A.D.), known in China by its Chinese pronunciation Gaogouli, was a part of the Chinese heritage. This came as a shock to many Koreans who had proudly claimed Koguryo to be an ancestral Korean kingdom. As Northeast Project became widely known, Korean reaction, both official and popular, was vehement and sustained. The Chinese were, in the minds of many Koreans, embarking on a course of unprecedented historical revisionism that threatened to destroy the newfound amity between China and Korea. What some may see as an obscure historical issue had a major impact in reducing South Korean trust in China. Chinese scholarly writings that differed from Korean national narratives were nothing new. What was new in the early 2000s was the frequency of such claims and, more troubling to many in Korea, the willingness of the PRC state to support and encourage them. Some of these official state actions were relatively under-the-radar as was the case in 2003 when a list of counties winning Beijing-awarded prizes for “relics preservation” included Jian county (Jilin province); it was celebrated for its preservation of Gaogouli ruins, because “The Gaogouli … was an influential ethnic group in China’s border areas in northeastern China.”1 Indeed, although the “Northeast Project” was initiated in 2002, it did not attract significant attention in the ROK until late 2003 and early 2004. The revelations of the existence of the Northeast Project and the Chinese claims that Koguryo/Gaogouli was part of Chinese, not Korean, history caused a firestorm of controversy in South Korea. And for a brief moment, officials and the general public alike seemed united in their opposition to China’s “distortion and “theft” of Korean history. Both the ruling and opposition political parties united on the issue. Then ruling Uri Party spokesman Woo Sang-ho declared, “China’s historical distortions have reached a dangerous level.” Another ROK politician declared the Northeast Project an evidence of China’s “ambition to completely deny the 5,000-year history of the Korean people.” Still another concluded that China’s efforts along with similar self-interested attempts by Japan to distort history were “not helpful to peace in Northeast Asia.8 The ROK government issued official protests of the Northeast Project, the way in which the PRC Foreign Ministry website described Korean history, and a host of related issues. It also established the Koguryo Research Foundation in an explicit attempt to oppose the Northeast Project and to refute its claims. 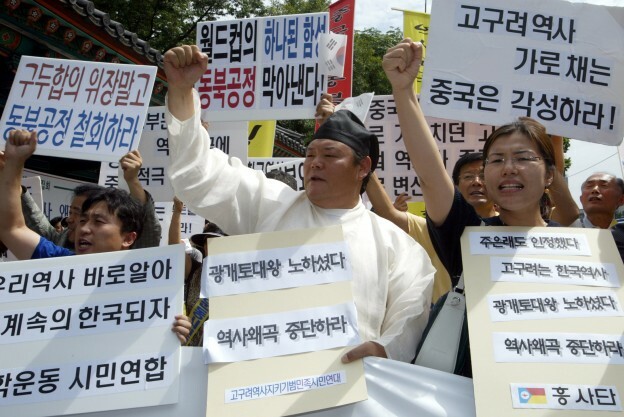 These official actions were welcomed by Korean citizens (including an increasingly active and visible “netizen” community), who donned Koguryo military garb and protested in front of the PRC embassy in Seoul and established a myriad of NGOs and websites to combat China’s claims and inform the rest of the world of the correct view. In the case of historical issues emanating from the original Koguryo/Gaogouli dispute, the ROK government could no longer pretend that there was no disagreement between Korea and China, even as it sought to contain it within academic and popular realms. However, in other disputes, the government declined to become involved at all, claiming instead that there was no official dispute in the first place, in spite of the statements by academics, netizens, and citizens. For example, in 2005, some Chinese got a taste of their own medicine as Korea applied to have the Dano Festival in the city of Gangneung recognized on the UNESCO Cultural Heritage list. Many Chinese—pointing to the Chinese tradition Duanwujie—expressed “embarrassment and displeasure and the feeling that Korea had stolen Chinese heritage.”21 The official Korean response was to claim that Korea was claiming only the particular Gangneung version of the festival as its cultural property, setting aside the origin and continued presence of Duanwujie festivals in China. Similarly, while some ROK academics have openly called for revisions of the official PRC accounts of the Korean War, the ROK government has refused to express any opinion on the matter.22 The ROK government has consistently avoided becoming embroiled in competing territorial claims in the area just north of the Korean Peninsula, most notably Mt. Paektu/Changbai and the Kando/Jiandao region. In both cases, some South Koreans have claimed that territory currently administered by the PRC was historically Korean territory and, therefore, should be once again part of a future (presumably reunified) Korea. Despite such views, the ROK state has maintained that there are no territorial disputes with China. But whatever citizens’ opinions of China may have been, it is apparent that they generally did not allow their feelings about the historical dispute to extend to other arenas. When it came to everyday economic, educational, and leisure activities, the trends of behavior toward China (and vice versa) showed only greater interaction and integration. Trade, travel, study abroad programs, diplomatic overtures (such as the 2008 upgrade in Sino-Korean relations from a “comprehensive cooperative partnership” to a “strategic cooperative partnership”)31 and economic integration (the 2015 ROK-PRC FTA) showed steady, positive growth. The first part of the 2010s witnessed a rebound in South Korean favorable attitudes toward China with one 2014 study concluding that the Korean public “now views China more positively than at any time since Asan began tracking this across a range of metrics.”32 However, the same study also noted, “wariness of China lingers just below the surface.”33 However, at the same time that the public appeared to be warming toward China, it also maintained a consistent preference for US leadership in the region. China has sought to capitalize on South Korea’s more recent friendliness toward China and decouple the ROK and the United States by emphasizing China and Korea’s shared experience of being a victim of Japanese imperialism. History could be seen, then, as a way to bring China and South Korea closer together. In 2015, the PRC and the ROK also joined forces to seek UNESCO acknowledgment of Japanese atrocities.37 In the same year Park Geun-hye attended a parade in China that celebrated the victory over Japan in World War II, standing alongside Vladimir Putin, Xi Jinping, and former Chinese leaders Jiang Zemin and Hu Jintao. While Park’s motivations and the consequences of this action were and remain topics of considerable debate,38 her presence at the parade can be seen as evidence of the centrality of the Japanese subjugation of much of East Asia and how shared anti-Japanese sentiment brought China and South Korea closer together for a time and still resonates with many Koreans. While the convergence of Chinese and Korean authorities on historical issues and disputes with Japan may be comforting to some Koreans, it is also apparent that the ROK state, much as it did with the Koguryo/Gaogouli dispute, sometimes attempts to resolve these disputes contrary to the fervent wishes of both the Chinese state and the Korean populace. This is most dramatically illustrated by the December 2015 Korean-Japanese agreement on the controversial comfort women issue. The agreement stipulated that Japan would pay a large sum of reparations to the surviving comfort women and that Prime Minister Abe Shinzo would provide a formal apology for the coercion of Korean women to serve Japanese soldiers and officers at brothels during the Sino-Japanese and Pacific Wars. While this move might be regarded as a bold and path-breaking one designed to improve Korean-Japanese relations, the agreement has been widely criticized by a majority in both South Korea and Japan. Once again, the state and society seem to be diverging over issues of history. The shared sense of historical grievance has not proved sufficient to paper over other issues that have troubled Sino-ROK relations. Many of these center around North Korea and the divergence of South Korean and Chinese policies toward Pyongyang. Disagreements over the proper response to the DPRK’s continued missile tests and the South Korean decision to welcome the deployment of American Terminal High Altitude Area Defense (THAAD) systems have strained what were previously seen as amicable and improving relations. China expressed its disapproval of a “hot-headed” Seoul that it was “skating on thin ice.” 39 In addition, some worry that the PRC might cut off popular South Korean performing groups’ access to China or fewer Chinese students and tourists might go to Korea.40 But to date, Park has firmly defended her decision and has called on China to take a more proactive stance toward North Korea and its nuclear weapons and ballistic missiles programs. The dispute has recently taken an interesting turn with some members of opposition parties travelling to China to “study” the issue more closely and to “listen” to Chinese opinions on the matter. This move has been criticized by Park and members of the Saenuri Party with party spokesman Chang Sang-uk labeling those who travelled to China as reviving the “serving the great” attitude toward China (sin-Chungguk sadaejuui).41 That Chang felt comfortable with this line of criticism speaks to the abiding sense of unease in the hearts and minds of many Koreans about their relationship with their powerful neighbor. Many in China fail to see how China’s policies can be seen as threatening to its neighbors. This is due at least in part to the influence of two most dominant strands of China’s sense of its own foreign relations history. First is the idea of China as solely a victim of outsiders’ depredations, most notably during the “Century of Humiliation” (bainian guochi) that began with the first Opium War and ended only with the establishment of the PRC in 1949. Seen in the context of this historical humiliation, any action of the PRC today is viewed largely as righting past wrongs, not muscle flexing. Second is the longstanding idea that not only is China the natural hegemon in the East Asian region but also that it achieved hegemony through benign and welcomed influence of its civilization and culture, not force of arms. Chinese leaders are wont to express this sentiment in unmistakable ways: Foreign Minister Qian Qichen’s claim that “China has never had the tradition of expanding abroad” or Wen Jiabao’s boast, “Peace loving has been a time-honored quality of the Chinese nation.”42 In the case of Korea, Chinese intervention on the peninsula—whether in response to the 1592 Hideyoshi invasions or during the Korean War—has generally been cast in terms of the Chinese elder brother helping out its younger brother. This view diminishes the role of the strategic and tactical calculations, which are thought to have motivated other state actors throughout history. Moreover, Korea has often been portrayed as China’s “model tributary,” voluntarily accepting Chinese regional hegemony and the benefits that could be derived therefrom. It is undeniable that the ruling state on the Korean Peninsula did indeed participate in what is often described as “tribute relations” with the ruling power on the Chinese mainland. Nonetheless, Koreans were not blind to the coercive aspects of the relationship, whether it be the Ming Chinese demands for human tribute—castrated boys to serve as eunuchs in the imperial court and girls to serve in the imperial harem—or repeated Qing interventions in Korean affairs in the late 19th century.43 For many Koreans, history has been replete with threats and vulnerabilities—they were a “shrimp among whales.” This sense of history and the continued divergence between state and society within the ROK as well as between China and South Korea regarding historical issues is likely to remain a factor influencing Sino-ROK relations for the foreseeable future. 1. “Relics protection prizes awarded,” People’s Daily, December 27, 2003, http://english.peopledaily.com.cn/200312/27/eng20031227_131336.shtml. 2. “What China’s Northeast Project is All About,” Chosun Ilbo September 30, 2009, http://english.chosun.com/site/data/html_dir/2008/05/30/2008053061001.html. 3. Korea University Professor Choi Kwang-shik noted that “One of the reasons why North Korea’s first application to UNESCO in 2001 was postponed was because of the sites’ poor condition.” See “What Is Behind China’s Attempt to Distort the Past?” Korea Times, September 5, 2004, http://www.thekison.org/pages/wn-135.htm. 4. UNESCO, “Capital Cities and Tombs of the Ancient Koguryŏ Kingdom,” http://whc.unesco.org/en/list/1135. 5. UNESCO, “World Heritage List,” http://whc.unesco.org/en/list. 7. James Brooke, “China Fears Once and Future Kingdom,” New York Times, August 25, 2004, 1. 8. “Yoya ‘Chung yoksa waegok’ kangnyok taeung ch’okku” Yonhap News, September 5, 2006, http://www.yonhapnews.co.kr/bulletin/2006/09/05/0200000000AKR20060905141700001.HTML. 9. In early- to mid-2004, editorialists for the Dong-a Ilbo could call with confidence for a unified effort to combat China’s “historical distortions. See “Chung yoksa waegok hammke taech’o haja” Dong-a Ilbo, July 6, 2004. However, by later in the year, the tone from the ROK state became much less confrontational and increasingly conciliatory toward the PRC. 10. Kim, Sung-nyon, “Chongbu Chungguk ui Koguryosa p’yonipjagop un mingan haksulhwaltong” Tonga ilbo, January 9, 2004, http://english.donga.com/srv/k2srv.php3?biid=2004011044598. 11. Korea Times, August 24, 2004, as cited in Andrei Lankov, “The Legacy of Long-Gone States: China, Korea and the Koguryo Wars,” Japan Focus, September 28, 2006, http://www.japanfocus.org/-Andrei-Lankov/2233. According to the ROK Ministry of Foreign Affairs and Trade, the PRC agreed that “There will be no additional distortion of interpretation of Goguryeo’s history made by the PRC government.” In addition, the PRC promised to meet a series of Korean demands ranging from “alteration of the Foreign Ministry web site’s distorted contents” to “removal of 4 sign boards (out of 6) with distorted facts about Goguryeo’s history at ‘Yongdam (Longtan) Mountain Fortress.’” ROK MOFAT, “Goguryeo,” http://www.mofat.go.kr/english/political/hotissues/goguryeo/index.jsp. See also “Beijing Backs Off in Koguryo Dispute,” Korea Times, August 25, 2004. 12. For Koguryo Research Center’s prodigious output, see the mammoth 1423-page compilation, Tongbukkongjong kwa Han’gukhakkye ui taeungnolli (Seoul: Yoyudang, 2008). 13. “No territorial problems between China, ROK, premier says” Xinhua, April 5, 2007, http://news.xinhuanet.com/english/2007-04/05/content_5940114.htm. 14. For UNESCO’s designation, see “Farmers’ dance of China’s Korean ethnic group,” http://www.unesco.org/culture/ich/en/RL/farmers-dance-of-chinas-korean-ethnic-group-00213. 15. See “China Lays Claim to ‘Arirang,’” Chosun Ilbo, June 23, 2011, http://english.chosun.com/site/data/html_dir/2011/06/23/2011062301297.html. See also, “Chungguk, ‘Arirang Chungguk munhwajae mandulgi’ nogolhwa” Yonhap News, December 6, 2012, http://www.yonhapnews.co.kr/international/2012/12/05/0603000000AKR20121205201651005.HTML. 16. See “Concerns about China’s listing of Arirang as one of its own national cultural assets,” KBS World Radio, June 24, 2011, http://world.kbs.co.kr/english/archive/program/news_issue.htm?no=21950&current_page=10). 17. See “’Komuljul mallijangsong’ uro kaldung chach’ohal seminga” Hankyoreh, June 7, 2012, http://www.hani.co.kr/arti/opinion/editorial/536655.html. 18. “China conducting closed research into ancient Korean dynasty,” Hankyoreh, January 26, 2013, http://english.hani.co.kr/arti/english_edition/e_international/571401.html. 19. “China distorts ancient history at Goguryeo museum,” Dong-a Ilbo,April 26,2013, http://english.donga.com/List/3/all/26/406136/1. 20. “China should stop distorting history” Dong-a Ilbo, April 28, 2013, http://english.donga.com/List/3/all/26/406137/1. 21. Roy Eun Seok Park, “Duanwu Festival. National Heritage and Cultural Ownership in East Asia,” Stanford Journal of East Asian Affairs 10:2 (Summer 2010), 119. Ironically, according to Park, the UNESCO Cultural Heritage designation “still did not attract much attention from the majority of Korean people because Dano was not a popular custom in Korea any more [sic].” See also “Duanwu: The Sino-Korean Dragon Boat Races,” China Heritage Quarterly 11 (September 2007), http://www.chinaheritagequarterly.org/features.php?searchterm=011_duanwu.inc&issue=011. 22. See “Chungguk nae 6.25 chinsil palkhiryonun moksori k’ojyo” VOA, June 26, 2014, http://www.voakorea.com/a/kroean-war/1944708.html. 23. See, for example, Chang Sang-jin, “Chunggukin ‘Han’gukin yoksajok chauisik chinach’oso silta” Chosun Ilbo, October 10, 2011. http://news.chosun.com/site/data/html_dir/2011/10/10/2011101001021.html. 24. Miles Yu, “Kim Jong-un stirs Chinese controversy over name of mountain he claims to have scaled” Washington Times, April 23, 2015, http://www.washingtontimes.com/news/2015/apr/23/inside-china-kim-jong-un-of-north-korea-stirs-cont/. 25. Northeast Asian History Foundation, http://www.nahf.or.kr/main.do. 26. Voluntary Network Agency of Korea, https://vankprkorea.wordpress.com/. 27. Jae-ho Chung, Between Ally and Partner, 98. 28. Associated Press, “South Koreans believe China likely to be biggest security threat in 10 years.” Chosun Ilbo, March 20, 2006, http://english.chosun.com/site/data/html_dir/2005/03/07/2005030761036.html. 29. Jae-ho Chung, “China’s ‘Soft clash’ with South Korea: The history war and beyond,” Asian Survey 49 (2009): 473. 30. “Even those surveyed who did not favorably view the United States, for instance, those who saw the U.S as an obstacle in North-South relations, believed that the ROK-U.S. alliance is necessary in the future. 87.2 percent of respondents supported the alliance in the future, including the 86.5 percent who consider themselves to be liberals.” Woo, Jung-yeop, “Shifting Political Ground in South Korea: Implications for the ROK-U.S. Alliance” Center for Korea-U.S. Policy Newsletter 3 (February 2011): 1. 31. “Korea, China upgrade relations to strategic cooperative partnership,” Korea.net, May 27, 2008, http://www.korea.net/detail.do?guid=23554. 32. “South Korean Attitudes on China,” Asan Report, July 2014, 8. 34. A video of Park’s speech is available at https://www.youtube.com/watch?v=cTeYiidTLlc. 35. Kwon Mee-yoo, “Ahn Jung-geun musical ‘Hero’ invited to China,” Korea Times, November 9, 2014, http://www.koreatimes.co.kr/www/news/culture/2016/07/145_167818.html. 36. Emily Rauhala, “104 Years Later, a Chinese Train Station Platform is Still the Site of Anti-Japanese Rancor,” Time, January 30, 2014, http://time.com/2609/104-years-later-a-chinese-train-station-platform-is-still-the-site-of-anti-japanese-rancor/. 37. Yi Whan-woo, “Battle for UNESCO listing in full swing,” Korea Times, October 10, 2015, http://www.koreatimes.co.kr/www/news/nation/2015/10/120_188043.html. 38. See, for example, Robert Kelly, “Why Park Geun Hye attended China’s World War Two military parade,” The Interpreter, September 7, 2015, http://www.lowyinterpreter.org/post/2015/09/07/Why-Park-Geun-Hye-attended-Chinas-World-War-Two-military-parade.aspx. 39. “China Voice: Hot-headed Seoul skating on thin ice with THAAD plan.” Xinhua, August 2, 2016, http://news.xinhuanet.com/english/2016-08/02/c_135558770.htm. 40. See, for example, Amy Qin and Choe Sang-hun, “South Korean Missile Defense Deal Appears to Sour China’s Taste for K-Pop,” New York Times, August 7, 2016, http://www.nytimes.com/2016/08/08/world/asia/china-korea-thaad.html; Ben Lefebvre, “The less-noticed deterrent to North Korea attacking South Korea: Chinese tourists,” Quartz, August 8, 2016, http://qz.com/750226/the-less-noticed-deterrent-to-north-korea-attacking-south-korea-chinese-tourists/; Kim Ki-bom, “Han-Chung kwangye kokjong … Chung sadu pobok e Han kiopin Chung yuhaksaeng ulsang” Donga Ilbo, August 9, 2016, http://news.donga.com/3/all/20160809/79650601/1#. Accessed August 10, 2016. 41. Kim So-yong, “Saenuridang Pang-Chung Tominju Uiwondul, ‘Sin-Chungguk sadaejuui…” CNBNews, August 8, 2016, http://www.cnbnews.com/news/article.html?no=330661. In the twentieth century, the term sadaejuui (“serving-the-great-ism) became synonymous with toadyism. 42. Yuan-Kang Wang, Harmony and War: Confucian Culture and Chinese Power Politics (New York: Columbia University Press, 2010), 2. 43. For Sino-Korean relations during the Ming, see Donald Clark, “Sino-Korean tributary relations under the Ming,” in Denis C. Twitchett and Frederick W. Mote, eds., The Cambridge History of China. Volume 8: The Ming Dynasty, Part 2: 1368-1644(Cambridge: Cambridge University Press, 1998),272-300. For Qing intervention in late 19th-century Korea, see Kirk Larsen, Tradition, Treaties, and Trade. Qing Imperialism and Choson Korea, 1850-1910. See also Larsen “Comforting Fictions: The Tribute System, the Westphalian Order, and Sino-Korean Relations” Journal of East Asian Studies 13 (July 2013): 233-258.